Mehndi-style, non-permanent body art with a shimmery twist. Draw on skin with the special adhesive using the fine applicator bottle or apply through one of the five included stencils. Dab on some glitter, and the result is sparkly, unique body art that is not stiff or sticky and lasts for days. 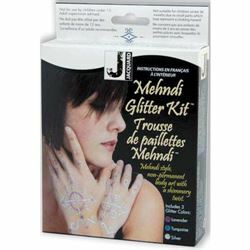 This kit includes three jars of glitter (silver, lavender and turquoise), adhesive in fine applicator bottle, special applicator tip, 5 self-adhesive stencils, cotton swabs and instructions with design ideas. Easily removable with baby oil. For ages 12 and up.